We hadn’t mentioned it yet, but Redleg Nation favorite Rob Stratton was sent to minor league camp in a development described as “shocking.” Another RN favorite, Edwin Encarnacion, was also sent down, despite playing well enough to win the 3B job outright (I’m hopeful we’ll see him in Cincinnati by mid-season). Ricky Stone and Randy Keisler were also cut, though neither of them had any business on the major league roster anyway, in my opinion. Rob Stratton took it as well as could be expected. He thanked the Reds for the opportunity and took his equipment over to the minor-league clubhouse. But when he chatted with reporters, he showed how badly it hurt. Stratton was among the five players the Reds cut from the roster Tuesday. Only one of the other cuts – Ricky Stone – was a surprise. Stratton getting cut was a shocker. Once again, Rob Stratton’s big-league dreams will have to wait. 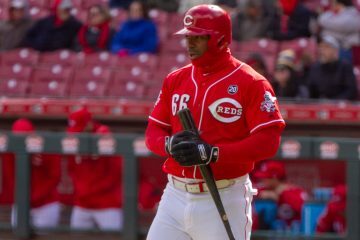 The powerful outfielder, who had been one of the most impressive hitters in Reds camp, was the most shocking subtraction in the latest round of cuts Tuesday. Stratton was reassigned to minor league camp along with relievers Ricky Stone and Randy Keisler. Optioned to Louisville were third baseman Edwin Encarnacion and catcher Dane Sardinha. It was an eerily quiet afternoon in the Reds’ clubhouse in Sarasota before the travel squad boarded a bus for the night game against the Red Sox, but Stratton’s demotion made some waves. The 6-foot-4, 275-pound slugger had earned plenty of respect among his peers with the businesslike way he had gone about his work this spring, and the success he had found on the field. As Stratton packed up his bag to head through the door to the minor league clubhouse, the big man fought back tears. “I did my best,” he said, his voice choking up. In 12 games, Stratton hit .324 with a team-high four home runs and 10 RBIs. Those numbers stand with anyone else’s in camp, but that wasn’t the overriding point to the Reds’ brass. Stratton was in contention for the final spot on the bench — primarily a pinch-hitting role — but the Reds believe he has a chance to be an everyday outfielder at some point, and decided sending him to the minors would be the best way to accelerate his development. “It was a matter of our coaching staff believing that he had made progress in his offensive approach, but that in order for him to continue to progress, he would need to get consistent at-bats,” said general manager Dan O’Brien. “The 25th man on our major league roster, that particular role does not necessitate the opportunity for regular ABs. So for his best interest, we felt we needed to put him at Louisville so he could continue with the current plan that he’s on. No matter how impressive Encarnacion was in camp — and he was very impressive, hitting .389 with a .476 on-base percentage in 17 games — the Reds want him to get regular at-bats, which he won’t be able to do in the majors this year. I don’t have a huge problem with Encarnacion being sent down to start the season. I just hope they aren’t hesitant to bring him up later in the year, when it becomes obvious that Joe Randa is a hack. With respect to Stratton, I see no reason that he shouldn’t have been given the 25th roster spot. He’s not going to be a superstar — heck, he may never be a major league regular — but he’s hitting his prime and he could serve the team well off the bench. He would certainly be a powerful bat to use in pinch-hit situations.